A beautiful 2/3ct I-SI2 colour and clarity diamond solitaire, set on a platinum ring. The Leo Diamond is a product of four generations of expertise in the art of diamond cutting, resulting in the first diamond that was independently certified to be visibly brighter than other diamonds with 8 additional facets compared to traditional round brilliant cut diamonds. Leo Diamond rings are independently certified by the IGI/GSI for colour, clarity, carat and cut. 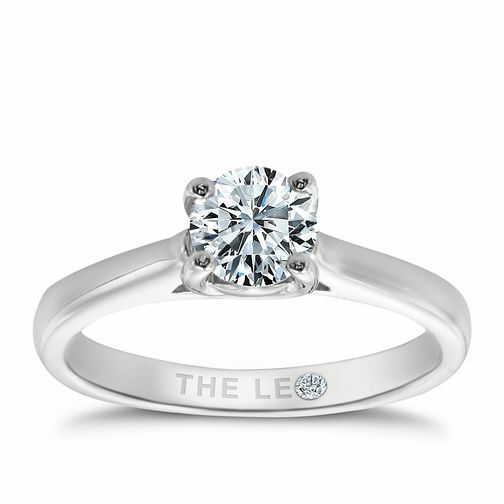 Leo Diamond platinum 2/3ct I-SI2 solitaire ring is rated 4.3 out of 5 by 4. Rated 4 out of 5 by Anonymous from An amazing ring. My partner is over the moon with this ring and it simply is beautiful! I dealt with the Cambridge branch who were all great and made the experience so fun and personal. The ring shines well, is a great size and stands so proud! It's not a cheap ring but it worth every penny and I would definitely recommend. Rated 5 out of 5 by Anonymous from Present for my beautiful Wife. This ring is stunning! It sparkles beautifully in the light. The Diamond is a good size and it stands proud. The presentation boxes are really nice. The pictures don’t do this ring justice. My Wife is over the moon with it.